Trouble seeing the image? Check out the original blog. Albert Gleeson, his pregnant wife, Pam, and his young stepson are struggling to adjust to their life on an acreage in Georgia after their return to our world. However, on his way home from a long day of teaching, Al finds that his home has been ransacked—and his family kidnapped. The police initially suspect him of foul play. When he’s finally cleared, accompanied by his friends, Al pursues the kidnappers to Abaddon, a continent whose main land surface rests ten kilometers below sea level. Their search eventually forces them to cross an even deeper abyss called Sheol, where the air pressure is so high that dragons can fly. Fighting frustration and despair at his inability to locate Pam and his stepson, Al soon begins to understand that he has a role to play in rescuing the enslaved prisoners of Abaddon. As a novelist, although I plan a particular story track, the characters usually “take over the story” as it were, and make it into something different. It means that I, as the story creator, can take the “something different” away for application in my own life. 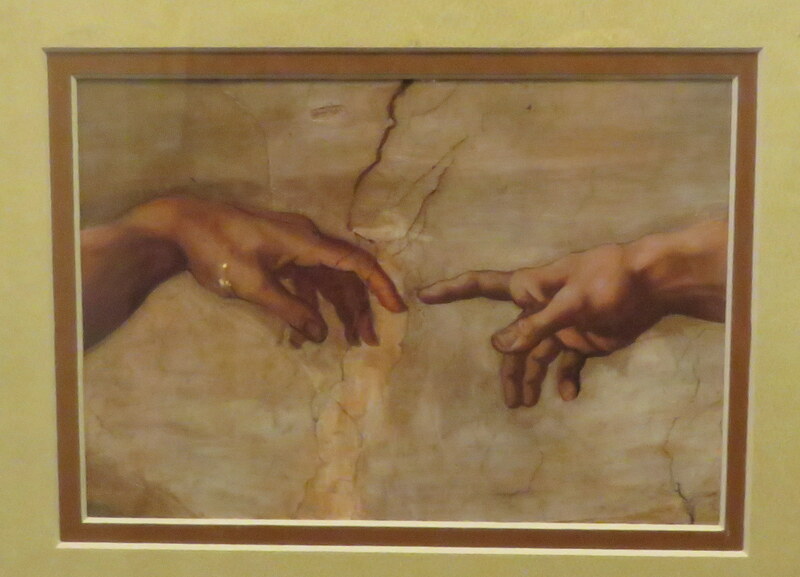 As a Christ Follower and as a person of hope, I, like everyone else face circumstances that cause me to ask “Why God?” Eventually, as Al taught me as I wrote this story, I need to turn this question into “What do you want me to do, Lord? Then I’ll start to see the kinds of things that Al saw. Tags: Christ Follower, Fantasy, Science in Science Fiction, SciFi, The Dragons of Sheol, The Halcyon Cycle, Why Lord? If you’re viewing this and some of the images have not been loaded … here is the link of the original WordPress blog. I had written previously about the essential difference between Fantasy and Science Fiction [Link]. An illustration of this is provided in how I deal with dragons in THE DRAGONS OF SHEOL when compared with other occurrences in literature, for example in Tolkien’s The Hobbit. Please don’t misunderstand me. I do not regard Tolkien’s silence on the question of “How can a large animal fly?” or “How can a dragon breathe fire without burning itself up?” as a defect. Not at all. Indeed, I regard The Hobbit and The Lord of the Rings trilogy among my favorite books of all time and would not like to change a thing. I merely wish to point out the difference in approach that the two genres take when designing the fabric of the story. As a genre, Science Fiction, often takes great pains to think about the physical laws involved, while for Fantasy these considerations are usually set aside. Many years ago, I listened to a captivating lecture by Professor Octave Levenspiel. His lecture has been published . He applied many engineering principles to animals reconstructed from the fossil record and argued that these animals existed and were able to function because the atmospheric pressure was 3-5 Bar (a little more than 3-5 atmospheres). The above figure is a log-log plot of mass (kg) against cruising speed (m/s). Since the lift (force holding the flyer up) is proportional to the square of the velocity and the first power of the wing area, one quickly runs into a limitation for birds. At our air pressure one of the highest wing loading (force/unit wing area) occurs for Canada geese. Indeed birds reconstructed from fossils (quetzalcoatlus and pteranodon) were much larger and were well above the one-atmosphere line. However lift is also proportional to air density. According to Professor Levenspiel, very large flying creatures, that is muscle-powered flyers weighing more than 14.5 kg, could only have flown if the atmospheric pressure was 3-5 atmospheres. Even in fiction, if I want to have dragons flying, I have to imagine a setting that is plausible. In my thinking this led to the continent of Abaddon. The sketch below shows the altitude of Abaddon on a much-contracted horizontal scale. 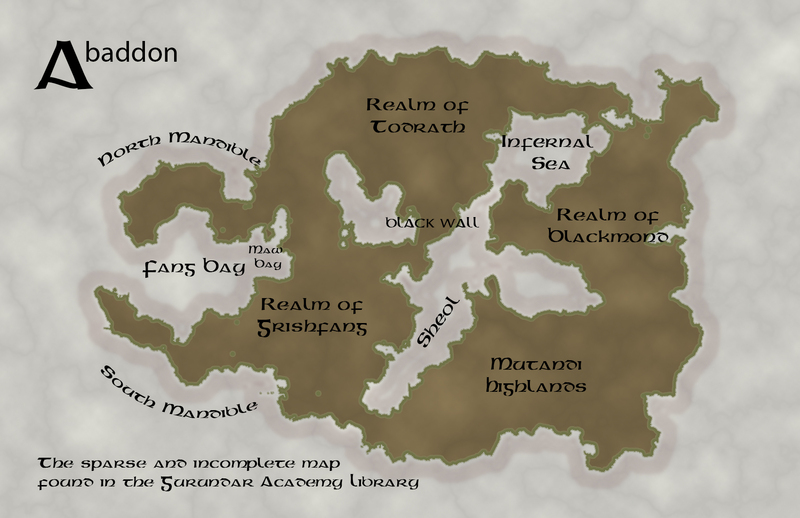 The Abaddon Plain is about ten kilometers below sea level while Sheol is about sixteen kilometers below sea level. For comparison, Mount Everest is 8848 meters above sea level. If sliced from the summit all the way to sea level, it would still be lower than the rim wall around the Abaddon Plain. Still, since Abaddon is a continent-sized plain, the ten kilometer rim wall on the scale of thousands of kilometers of plain, make the rim wall quickly disappear over the horizon. Rough calculations on the pressure (assuming temperature is approximately the same as at sea level) would make the pressure approximately three atmospheres and six atmospheres respectively for the plain versus Sheol. Given the higher air density, much larger animals could fly at these pressures using muscle-powered locomotion, but it brought up the interesting idea: if the larger dragons grew so large they could only fly in the lower reaches of Sheol, then only the smaller ones could reach the higher terraces. So how does one drop from the Abaddon Plain to Sheol? One huge drop? A steep slope? How about steps? Using steps has some interesting possibilities as shown in the figure below. Depending on the geometry, line-of-sight would block vision of all but the immediate terrace below the escarpment edge. This fact, coupled with the danger of dragons rising from the depths would make the terraces an ideal place to hide. This plays a significant role in the story. Want to Check Out Peter’s Books? 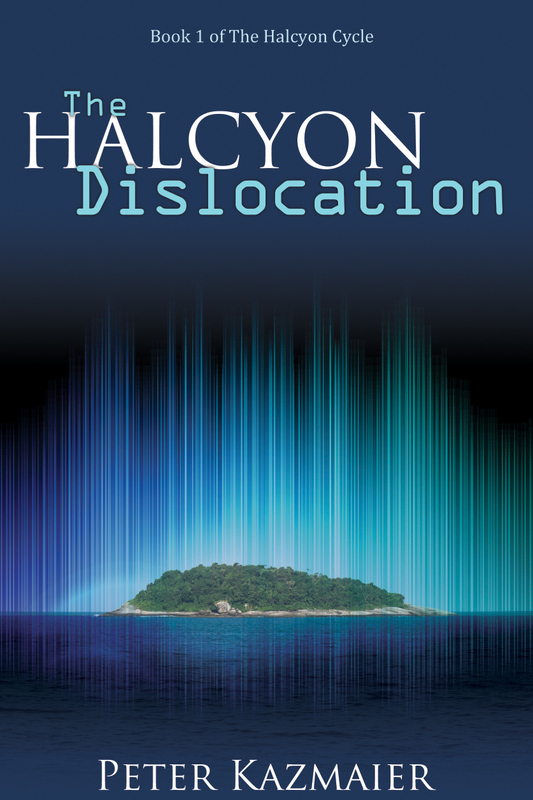 Read The Halcyon Dislocation for free at the Mississauga Library … if your library doesn’t have it, you can have your library request the e-book from Overdrive or the trade paperback from Amazon or Indigo. Why not check out Peter’s author page on Amazon? Here is the proposed cover for the Dragons of Sheol, my fourth book overall and the third in The Halcyon Cycle. I would appreciate your feedback on the design. The book should be available in May. If you’d like to read the first chapter, use this link. The third book in The Halcyon Cycle begins with the kidnapping of Albert Gleeson’s pregnant wife and adopted son. Mistrusted by the police, he follows them through a portal to a continent called Abaddon that is ten kilometers below sea level. This land is filled with strange and terrifying creatures. In the center of this continent is a vast chasm, named Sheol, that drops in steps to an infernal sea fully sixteen kilometers below sea level. The high air pressure at sixteen kilometers below sea level supports dragons who are able to fly despite their size. Gleeson’s nemesis, Bigelow, in his insatiable quest for power and dominion, has become a monster with an army at his disposal. The searchers become the hunted as Bigelow drives Gleeson and his friends into the depths of Sheol. If you liked The Halcyon Dislocation, I hope you’ll give The Dragons of Sheol a try. This book has taken me three years to complete. After seven drafts, it’s ready for my editor. I am looking forward to publishing this in 2019. I am always delighted to hear from my readers. Tired and hungry, Dave and Glenn returned to their room and turned on the TV to see if broadcasting had resumed. To their surprise Jennifer McCowan, the blonde talk show host of Halcyon Music, was on the air. Vlad, a tall, big boned youth in his mid-twenties, had a long, narrow face and close-set eyes, so that the overall impression vaguely reminded one of a horse. He had shoulder length hair and stubble on his face. “By field boundary I mean the edge of the force field bubble. Shooting a missile through this barrier is, as Hoffstetter would say, ‘like trying to shoot into last week.’” Vlad was beginning to get exasperated. This was followed by a momentary pause and a baffled look on McCowan’s face. “How big did the bubble get?” she finally asked. “I think it expanded to a sphere about four miles in diameter,” said Vlad. “Then a second series of lightning strikes overloaded the offset controls, and the time offset increased enormously,” said Vlad. Beads of perspiration had appeared on his forehead. McCowan uncrossed her legs and leaned forward. “Tell the audience what you think happened next,” she prompted. “Vaguely,” said McCowan, a blank look on her face. “Let me see if I can make it as simple as possible. Macroscopically, that is, in the world of meter lengths and kilogram masses, energy seems to be continuous. It flows like a stream or a river. So if I ask how much energy it takes to lift this book,” he lifted a book from the table, “you can calculate the energy in joules to as many decimal places as you like. I can lift the book to any height and calculate the lift energy for each height. But when you go down in size, ten orders of magnitude to angstroms, the world changes. When lifting electrons away from the atomic nucleus, all the rules change, and one can only ‘lift’ the electron to discrete ‘heights,’ or energy levels. It’s like being able to lift this book in little jumps.” He demonstrated by rapidly lifting and stopping the book at various heights. “You can’t be serious!” said McCowan. “I’m deadly serious,” said Sowetsky evenly. Is this even possible? Normally in quantum mechanics, quantization comes about because of boundary conditions. Think of a guitar string. A loose guitar string doesn’t produce a pure tone. Only when it is stretched between two points (think boundary conditions) does one obtain a pure fundamental frequency along with the overtones. These frequencies represent quantization of the sound (the fundamental and overtones are related mathematically). It’s not easy to see why time should have boundary conditions and so quantization seems unlikely at first glance. 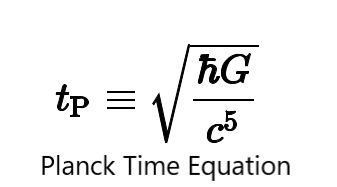 However, in 1899, the great physicist, Max Planck, proposed a natural unit of time based only on universal constants such as the gravitational constant, Planck’s constant, and the speed of light. Planck’s time (ca. 5.39 x 10^-44 seconds) is a small number indeed and is considered by many physicists as the shortest time interval possible. Similarly, the inverse quantity, 1/tp, is a frequency and may represent the maximum frequency possible. Perhaps there are boundary conditions for time and the idea of time quantization are not as far fetched as it seemed at first glance. In any case, Planck Time, or the Mintival described by the character Vlad Sowetsky in The Halcyon Dislocation are very short time intervals indeed. They are much shorter that the time of one vibration of a hydrogen molecule or the shortest time observed experimentally (8.5 x 10^-19 seconds (2010)). This provides a trivial solution to the time paradox. In the time paradox, one short circuits a chain of cause and effect events. That is to say, travelling back in time means the traveler invariably makes changes or initiates new causes that change the future. Or does he? There are usually two solutions. In one possible solution, each change initiates a new multiverse or parallel word strand. A second solution (illustrated in C. S. Lewis’ The Great Divorce (he references getting the idea from a science fiction novel) centers on the idea that the traveler cannot affect the past at all. It’s like adamant. Not even a blade of grass could be bent by the visitor. With very short time intervals, traveling backward in time does not generate a violation of the time paradox because over these time intervals nothing happens so nothing changes. So you see time travel should be possible as long as the trip backwards is very short! Science Fiction often begins with a “What If” question. What if humans developed telepathy? What if we were visited by an alien race? The Halcyon Dislocation is no exception. One of the prominent “What If” questions I asked as an author: “What if time were quantized and parallel worlds could exist side by side in these overlapping time intervals?” Here is how it was described in the book when one of the physics graduate students tries to explain how the island university of Halcyon was moved to a new world. Back in the dorm room there was brooding silence as the interview on the television drew to a close. Glenn suddenly got up and threw a magazine as hard as he could against the wall, cursed, and stomped out of the room. Within minutes, Dave heard the sound of an ominous rumble, like the growl of a giant beast being roused from a troubled slumber. He went out into the hall to investigate. Students were everywhere. Approaching the common room, he felt the air electric with tension. The fear and anger that had been building over the last two days was growing, and students were gathered in groups. Most had seen the television show, and they were loudly blaming Hoffstetter for their predicament. How feasible is the quantization of time? More thoughts on this later. If you’re interested in reading more look here or check your library.